Well well well, on Wednesday the 7th of January Microsoft released Windows 7 beta for the public to test run and see how it works. Me being the geek that I am I couldn’t resist and download it to try out on my laptop (a 4 year old Asus M6Ne) which I did last week Sunday. I have never tried Vista because I heard so many negative things about it so I was kind of sceptic about Windows 7, eventhough people were pretty positive about it. 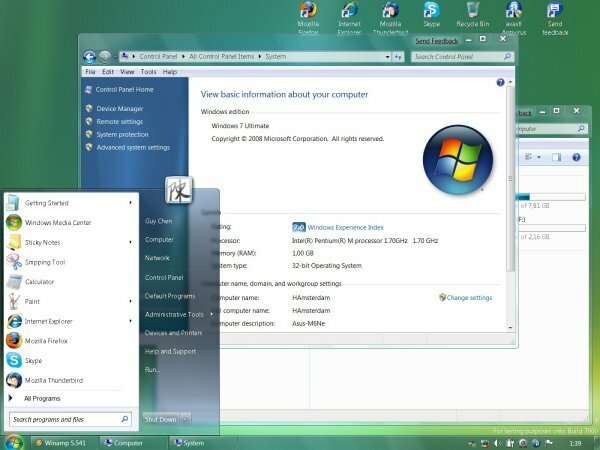 Vista has been plagued with the legacy of a negative reputation, this is because Microsoft changed the driver model and quite a few things at once. Most heard issues with Vista is the memory usage, resource hog, drivers that don’t work which means hardware not working, UAC popping up everytime etc etc etc etc. I am glad to say that Windows 7 is running quite smoothly and that almost all my hardware was recognized imediately. The only two things that I can’t seem to get working at the moment are the Intel Wireless 2200gb card and my pci modem. 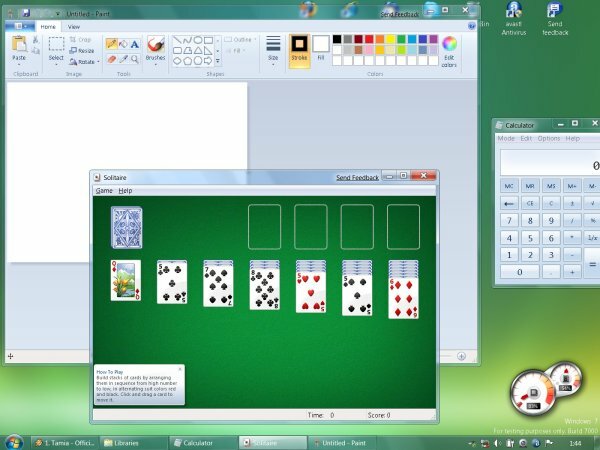 Other than that Windows 7 runs pretty smoothly. I really need to get my wireless card working and find a way to see if and how the CPU throttling is. Because I have the feeling that my CPU is running full clock speed, but that could be a figment of my imagination. Damn, the CPU isn’t throttling dynamically. It keeps running at max clockspeed (in my case 1,7GHz, Dothan Pentium-M). This is quite disappointing to be honest. I was hoping Win7 would be able to use speedstep to dynamically alternate the CPU clockspeed to conserve power and so that my fan won’t be on most of the time. But then again, I was kind of expecting speedstep not to work since the fan keeps blowing most of the time when working in Win7. Time to google for an solution, which hopefully can be found. Oh and before people start thinking about changing the power settings in Win7. I already did switch to Power Saver mode and fiddled around in those settings. But alas to no avail. 🙁 So if someone knows something or has a solution please post here. Other than that, Win7 seems to be working properly. So, how’s Win7 treating you? I’ve got a V6V, which has about the same specs as your M6Ne, yet I equipped it with 2GB of RAM. I didn’t venture into installing anything else on it then the pre-supplied WinXP, yet I’m really curious now. How are you man? Long time no see. We should meet up sometime in the near future. 🙂 Well, Win7 is treating me relatively well. I am using it on a daily base, surfing, office, mail etc. I can actually say it’s like I’m running WinXP SP3 the only thing is that not all the software is working perfectly yet. Office 2k3 tends to take longer when fiddling around in settings and freezes or crashes a bit faster. Also I’m using skype 4beta since Win7 recommends that over the stable version. But I don’t like skype, it’s still buggy and my webcam freezes up a lot. That’s probably because skype is beta and running on a beta OS. I do have to say that I still have to find my way around Win7 with settings and all of that. Most common things I’ve found but I have to get used to it. I think if you’ve fiddled around with Vista SP1 you should find your way in Win7 much faster. So I guess you have a project for the weekend. 😛 Doesn’t your gf mind though? Instead of skating or somthing like that you behind the laptop. 😛 But then again, we’re true geeks 😉 Anyway, let me know how your experiences are with Win7 if you decide to fiddle around with it. I most certainly will, when I come round to installing it on my PC. Thanks for the help! I credited you on my blog post which also has a download link for the Intel wireless drivers.